A Tampa Bay camp is helping local kids overcome the emotional struggle of losing a loved one. 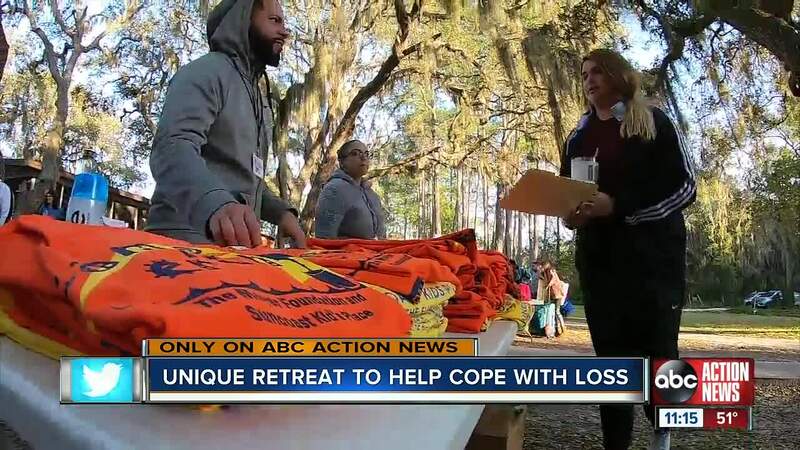 BROOKSVILLE, Fla. — A Tampa Bay camp is helping local kids overcome the emotional struggle of losing a loved one. Camp Erin is a free, weekend-long bereavement camp at Lakewood Retreat in Brooksville. Volunteers and mental health professionals are there for kids ages 6-17, providing coping skills and grief education, with traditional outdoor camp activities. "It’s like a little private club that nobody wants to be apart of," said father Ash Rabah. Newsome High School suggested Rabah send his 16-year-old daughter to the camp this year. "I just remember thinking, if I couldn’t save my own brother, who could I save?" Hannah-Elizabeth Rabah was just 13 years old when she found her brother shortly after he took his own life. "To be at a camp full of all people who have gone through this loss is definitely something that I thought would be helpful," said Rabah. Adyson Duroe, 12, attended this year's camp with her 9-year-old brother. Their father, Mike, died in July after a 10-month battle against brain cancer. Mike Duroe was a hall-of-fame wrestling coach in Iowa. The family recently moved to Florida after Mike's death, looking for a fresh start. "We might have a lot of stuff in common and we can talk about, like what happened, how it happened and everything," said Duroe. Adyson's mother, Leah, hopes Camp Erin will provide a positive outlet for her kids to grieve a tremendous loss. “Knowing that they could talk to other people about what’s going on with them, each and everyday, that we can’t relate to." If you'd like more information on Camp Erin, click here .